We found a great deal for all of you 49ers fans that are looking to pick up the new Madden NFL 13 game by EA Sports. 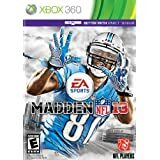 Order "Madden NFL 13" for PS3 or Xbox 360 and you will receive a $15 promotional credit via email that can be used toward the purchase of items shipped and sold by Amazon.com. More information on the promotion can be reviewed using the link below. Are you interested in buying in-store from Best Buy instead? We found a deal with Best Buy that lets you pre-order the game and get a $10 credit. Click on one of the links below for more information.